ALA Editions, an imprint of the American Library Association, 2013. Morgan Kaufmann, an imprint of Elsevier, 2013. The Scarecrow Press, Inc., 2013. McFarland & Company, Inc., Publishers, 2013. The University of Chicago Press, 2013. The Belknap Press of Harvard University Press, 2013. Routledge, Taylor & Francis Group, 2013. W. W. Norton & Company, 2013. Libraries Unlimited, an imprint of ABC-CLIO, LLC, 2013. Neal-Schuman, an imprint of the American Library , 2013. Nova Science Publishers, Inc., 2013. John Benjamins Publishing Company, 2013. Pearson Allyn & Bacon, c2012. 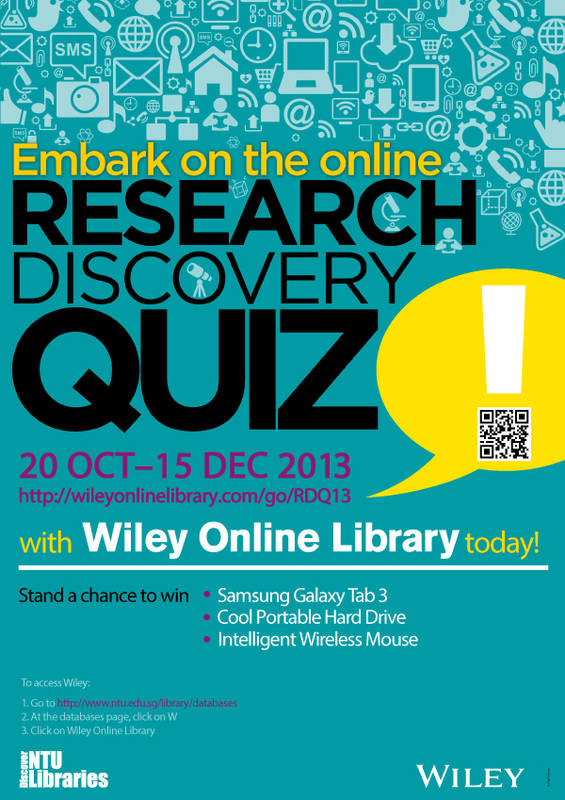 Embark on the online Research Discovery Quiz with Wiley Online Library today and stand a chance to win attractive prizes! To participate, click on the image below. Changing times bring about new challenges for our society. How will this affect the man in the street? Get your questions answered at our upcoming talk! For more details, see the poster below. To register, click here. Routledge/Taylor & Francis Group, 2013. ALA Editions, an imprint of the American Library, 2013. Association of College and Research Libraries, a division of the American Library Association, 2013. Richard Walsh, Jeffrey L. Staley and Adele Reinhartz. The Edwin Mellen Press, 2013. University of Hawaiʻi Press, c2010. Biltereyst, Daniël, 1962- editor of compilation. Bailey, Peter J., 1946- editor of compilation.